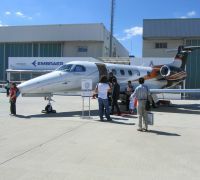 Istanbul, Turkey’s long established Ataturk Airport hosted the ninth Airex Civil Aviation show this year 6-9 September. Jane Stanbury takes a look. The bi-annual event is pitched at demonstrating to the Turkish and Eurasian aviation market place the latest innovations, news and trends from the civil and business aviation market. Sponsored by Turkish Airlines and Tav Airports holding which claims to be one of the fastest growing brands in the airport industry, the show was host to a mix of general aviation enthusiasts, aviation executives and those seeking information about jet purchase. Gyrocopters, training schools and aircraft components exhibited along side Agusta Westland and an impressive number of OEMS. Over 150 companies exhibited and 52 aircraft filled the static, including an Emirates A380 that touched down for the first day of the show. Any sceptics doubting the significance of the show were impressed to note that a steadily growing Turkish economy enticed leading international executive jet OEMs to attend. 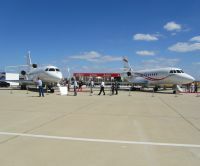 Bombardier, Gulfstream, Embraer and Dassault all had a strong presence. Whilst they may be in competition for clients, one point the OEMs all agree on is the importance of the region to the business jet market. It is anticipated that over 1,100 business jets will be sold into the region over the next 20 years. The Turkish economy is relatively stable and increasingly the country is seen as an aviation stepping stone to the Middle Eastern region. “The Middle East and Turkey’s appetite for business aviation is continuing to expand as more businesses start to embrace the true value of corporate aviation,” said Khader Mattar, Regional Vice President, Sales, Middle East, Africa and India, Bombardier Business Aircraft, talking about the opportunity for Bombardier. The Canadian company demonstrated its Learjet 60 XR, Challenger 605 and Global 6000 jet with the Bombardier Vision flight deck displayed aboard the Global 6000 aircraft. Embraer hosted a chalet in conjunction with local partners Delta Aerospace AS and presented its light Phenom 300 which was certified in Turkey earlier this year, as well as the larger Legacy 650 with its new enhanced interior and the ultra-large Lineage 1000. Embraer delivered its first Phenom 300 to Turkey this June and is eyeing-up the prospects. Embraer Executive Jets President Ernie Edwards commented to local media that the Legacy was proving popular in the region and they already have a Legacy 600 working as an Air Ambulance operated by local business Kocoglu Aviation. Edwards also confirmed that Embraer views Turkey as a region with great potential, not least of all because of its proximity to the Middle East. Dassault’s Christophe van den Broek, the French company’s International Sales Manager for Business Jets, commented: “Dassault was one of the first companies to sell a business jet into the region and so far in 16 years we’ve sold about 34 jets into the country which now has a fleet of about 80 executive jets. It’s an important region for us and we are even thinking about opening an office in conjunction with a partner.” Van den Broek states that the Falcon 2000 and 7X are popular models for its predominantly corporate customer base but notes that for major maintenance the aircraft still have to head to northern Europe. One company that has genuinely committed to the region is privately owned Swiss business AMAC Aerospace. 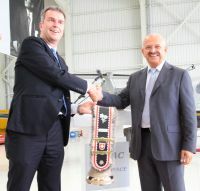 A cocktail reception hosted by Kadri Muhiddin CEO and Executive Chairman of AMAC Aerospace and Atilla Guney, Chief Operating Officer, Amac Turkey celebrated the inauguration of AMAC Turkey’s hangar facility. The state-of-the-art structure features 1,500sqm of hangarage, 1,200sqm of shop floor space and 300sqm of office space, and will be fully operational by the end of the year with maintenance approvals for the Pilatus PC12 expected by the end of February. Initially, the 22-strong Istanbul-based team will be dedicated to providing a full range of maintenance services for the Pilatus PC12-NG aircraft as AMAC’s strategy is to provide support for new and existing owners of the Pilatus PC12 both nationally and further afield in the Middle East. The commitment to the PC12-NG maintenance follows the announcement at the beginning of 2012 of the joint venture between manufacturer Pilatus and AMAC Aerospace which saw AMAC appointed as a fully authorised and exclusive Sales Distributor for the PC-12NG in the Middle East. 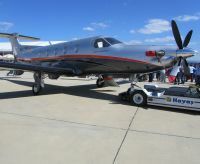 AMAC exhibited its own versatile, high speed six-seater turboprop at the Turkish show and received much interest from the delegates. Mr Guney said, “Airex enabled us to demonstrate our capabilities at the new hangar for PC12-NG maintenance. Looking to the future we are planning to expand our maintenance offering to service a wide variety of aircraft types in the region and are already in discussions with a number of OEMs.” AMAC’s hangar could support maintenance on larger business aircraft up to Challenger and Dassault Falcon dimensions. “For Middle Eastern owners and operators the option to fly to Turkey for maintenance, rather than further into Europe is an attractive proposition”, he continued. However it’s not just business aviation that is growing. Turkish Airlines was bullish announcing its aim for a fleet of 750 aircraft by the year 2023 and is planning to buy new aircraft to reduce the average age of the fleet. The national carrier is already flying Airbus A330-300 and is also exploring other options including the Boeing 777-300. The airline is constantly expanding routes and is continually developing its maintenance centre at Sabiha Gökçen Airport, on the Asian side of the Bosporus, which opened in 2001. It already has an engine maintenance centre which it operates in a joint venture with Pratt and Whitney and is aiming to create the largest greenfield maintenance centre in the country in conjunction with a number of partners. The airport, which is considered to be Istanbul’s second airport, supports development of an "Advanced Technology Industry Park" which focuses on developing numerous industries including transportation, foreign trade, aviation and technology.